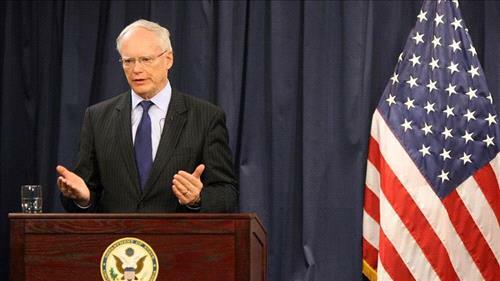 AMMONNEWS - ISIS extremist group is down to its last few hundred fighters and less than a square kilometer of land in a battle for its final Syrian stronghold, although it may have 15,000-20,000 armed adherents in Syria and Iraq US envoy James Jeffrey said on Friday. “We are just about finished with the campaign along the Euphrates to defeat the last territorial holdings of the ‘caliphate’. They’re down to a few hundred fighters and less than a square kilometer of land,” said Jeffrey, the US Special Representative for Syria Engagement and Special Envoy to the Global Coalition to Defeat ISIS. Jeffrey said the United States was helping the Syrian Democratic Forces in Syria to secure ISIS prisoners but was also launching a campaign to get countries to take back foreign fighters and their families, to prosecute or re-educate them. “We believe that there’s between 15,000 and 20,000 Daesh armed adherents active, although many are in sleeper cells, in Syria and in Iraq,” Jeffrey said, using an Arabic acronym for ISIS. Speaking to reporters on a video call after attending a Syria humanitarian conference in Brussels, Jeffrey said the struggle to defeat ISIS ideology would go on and there was no timetable for a full US withdrawal from Syria. The United States would also maintain a force at al-Tanf close to the Iraqi and Jordanian borders to bolster local forces against ISIS. With a smaller force and much less combat after the territorial defeat of ISIS in Syria, US costs would be far less, Jeffrey said. In 2018, US military operations in Syria cost about $2 billion out of a total defense budget of $700 billion, mainly expenditure on precision-guided munitions.